Dr Caroline Leaf is a communication pathologist and a self-titled cognitive neuroscientist. She has also proclaimed herself as an expert on science and the Bible. In order to prove that the Bible is the ultimate scientific authority, Dr Leaf attempts to find scientific studies which support Biblical concepts. One example of this is her teaching on Glossolalia, the scientific term for the Biblical concept ‘speaking in tongues’. Dr Leaf’s Facebook factoid on the neuroscience of speaking in tongues is at least the second time she has posted it. In November when I first saw Dr Leaf’s proclamation on the science of speaking in tongues, I was fascinated. I went to find the research for myself to see if the areas involved in discernment in the brain really increase in activity when speaking in tongues. As it turns out, there isn’t any. The only study that I could find about brain functioning during speaking in tongues was by Newberg . As I wrote in my previous blog, the study by Newberg showed the part of the brain that’s involved in both speaking in tongues and discernment, the ventromedial prefrontal cortex, decreases in activity when praying in tongues, not increases, in direct contradiction to Dr Leaf’s meme. 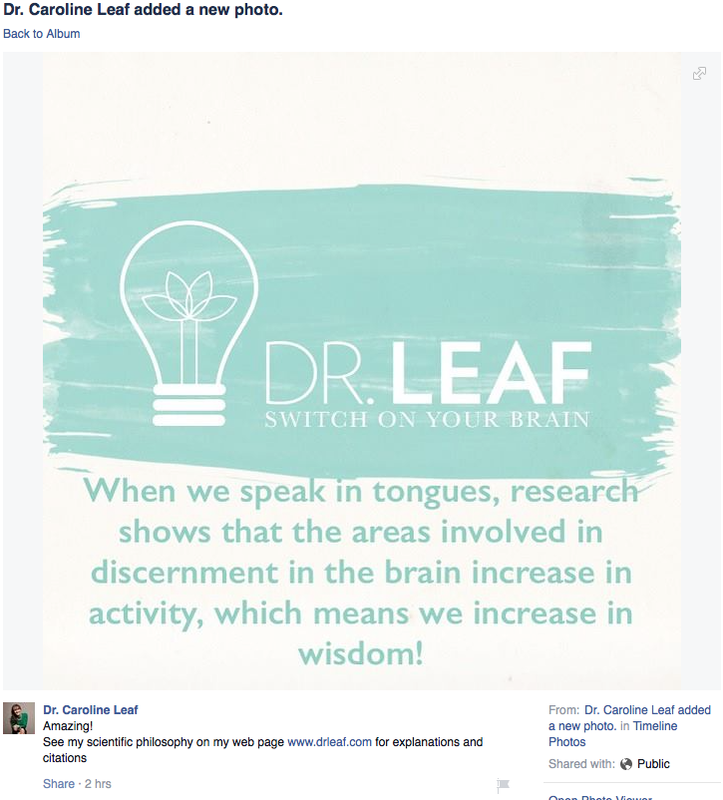 Today on Facebook, Dr Leaf demonstrated that she can not be swayed from her entrenched idea that speaking in tongues increases discernment … or can she? Her meme and her discussion on glossolalia in her ‘Scientific Philosophy’ seem contradictory. In this paragraph, Dr Leaf confirms that frontal lobe activity decreases when speaking in tongues, in keeping with her anecdotal evidence of “self-reports of what people who spoke in tongues experienced, implying that the words spoken in glossolalia originate from a source other than the mind of the individual speaking in tongues.” But this is in direct contrast with her social media meme, which suggests that speaking in tongues increases frontal lobe activity – the area of the brain common to glossolalia and discernment is the vmPFC, which decreases with glossolalia and increases with discernment. Dr Leaf is a confusing enigma. She posts social media memes that are clearly wrong, even disagreeing with the scientific papers she has written about and her own conclusions in her own manifesto. This only discounts her legitimacy. You can’t continue to contradict your own evidence. It’s like shooting yourself in the foot, or digging your own grave. What’s worse, Dr Leaf teaches this from real pulpits, not just on social media. How is her audience supposed to feel when they hear what she has to say and find it disagrees with her own scientific philosophy? I sound like a broken record, but Dr Leaf desperately needs to review her teaching and social media memes. It’s bad enough to be contradicted by scientific evidence, but to be in disagreement with your own teaching is embarrassing, and does nothing to preserve trust with your audience. Newberg AB, Wintering NA, Morgan D, Waldman MR. The measurement of regional cerebral blood flow during glossolalia: a preliminary SPECT study. Psychiatry research 2006 Nov 22;148(1):67-71. This entry was posted in Biological, Caroline Leaf, Psychological, Spiritual and tagged caroline leaf, criticism, discernment, dr caroline leaf, Facebook, glossolalia, meditation, meme, Newberg, prayer, speaking in tongues, SPECT, wisdom by cedwardpitt. Bookmark the permalink.